An awesome picture somehow dug up by the sports gossip site TerezOwens.com! Some of the great old-school posters seen on Brett’s ceiling: Jose Canseco “40-40”, Jerry Rice “Goldfingers”, Michael Jordan “Big-Time” Door-Sized, Bo Jackson “Double Trouble” (Royals & Raiders), Dwight Gooden 1980s SI Poster, Joe Montana “Job Security”, and what looks like QB posters of Randall Cunningham and Warren Moon, among others. (Note that TerezOwens calls this “Brett Favre at 23”, but that would date this picture at 1992, when he was already an NFL QB with the Atlanta Falcons. 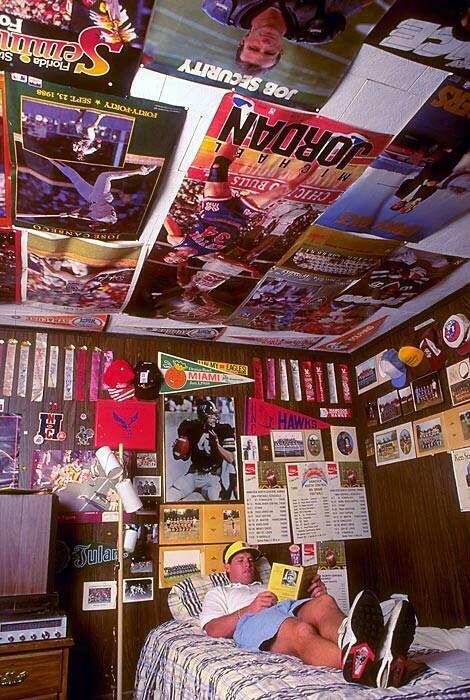 Most likely, this is Brett in his Southern Miss dorm room, circa 1989. Brett Favre in his Dorm Room at Southern Miss, c.1989. Baseball holidays rarely transcend outside the sport — you celebrate Opening Day, but it doesn’t have an impact outside baseball and its fans. But Jackie Robinson Day is a different case, as April 15 celebrates a day that resonates across all sports and American culture. The day commemorates the anniversary of Robinson’s major-league debut with the Brooklyn Dodgers in 1947, a landmark moment as the first African-American to break baseball’s color barrier. No image captures that historic aspect of the day better than this photo taken from April 15, 1947 — Robinson, arm in arm with three white Dodgers teammates: Spider Jorgensen, Pee Wee Reese, and Eddie Stanky. This was a sport embracing something in a way that helped society do the same. What do you remember most about Jackie Robinson? If you’ve seen the new movie “42” celebrating his life, what did you like best about the movie? This is a day to celebrate all things Jackie Robinson, so your comments are welcome. This is a huge weekend for Jackie Robinson fans — Monday, of course, is Jackie Robinson Day, when major-league baseball celebrates his legacy every year on the anniversary of his historic debut in 1947. This year has a much greater awareness of Robinson because the movie that chronicles his life “42” — opens nationally in theaters today, bringing the unforgettable story of a baseball pioneer to another generation. What makes this photograph so memorable? Perhaps it’s the ballcap literally flying off his head the instant the picture was taken, or the perfection of his slide, or the look of the supporting cast, from the outstretched catcher to the umpire and teammate watching. Robinson even stole home in a World Series game — in 1955 against the Yankees, with Yogi Berra catching — and you can see a video of that play here. But if you’re looking for a single image that captures Jackie Robinson’s amazing baseball career, this poster might be it. “Share your Fan Walls and Win” 2013 Contest Winners! 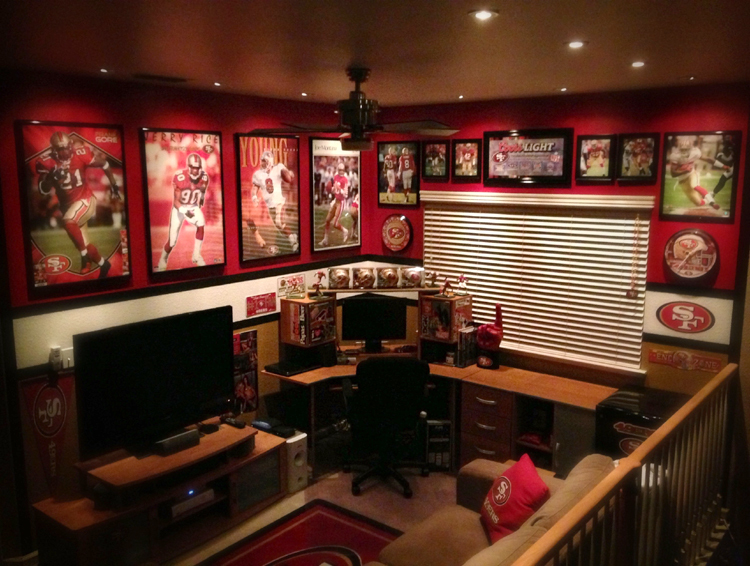 Thank you all for participating in our 2013 “Share your Fan Walls and Win” contest! With so many great entries, it was a real challenge to pick the best-of-the-best; but rest assured, the winners were more than worthy. Judged by our President, Neil Flagg, and our Customer Service Manager, Islay Julen, each entry was evaluated on the criteria of: poster content, poster presentation, and overall room design. First, the posters: four awesome action posters of all-time San Francisco 49ers greats, including two classics still available at SportsPosterWarehouse.com (Joe Montana “Signature Series” and Jerry Rice “Going Deep”). Next, the presentation: each one is handsomely displayed in identical professional-quality glass frames with attractive black moulding for a classy touch, and brought to life with recessed halogen lighting placed at measured intervals. Finally, the overall room design: Herman went all-out with official Niners red-and-gold colors, and other great Niners accents like clocks and pillows that top the room off to perfection. Congratulations, Herman – and hope the rest of you got some great ideas for next year! 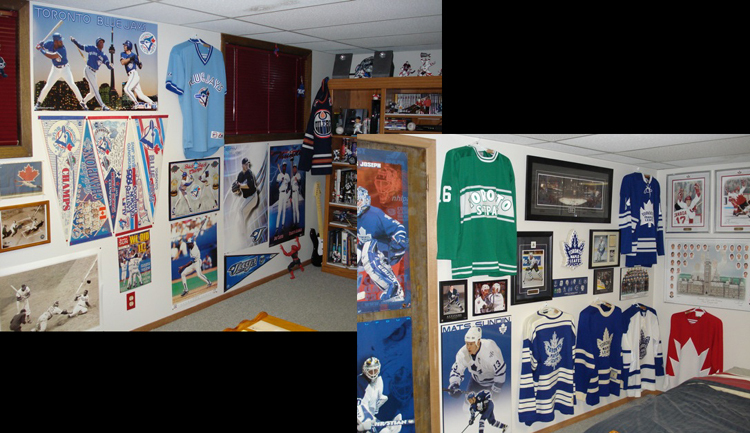 Our second prize winner ($50 credit at SportsPosterWarehouse.com) goes to Mark Daley of Ontario, Canada, and his phenomenal bedroom we’ll call “The Canadian Cave”. What this room lacks in comfort and finish, it makes up for in having one of the most unique collections of rare old-school posters we’ve ever seen! 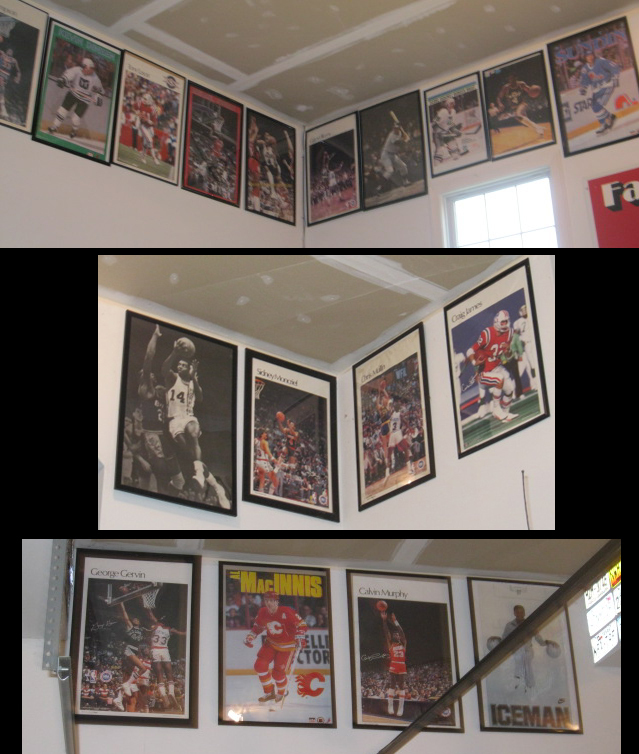 Displayed in sharp black frames around the ceiling line of his home’s garage are an eclectic mix of players in original Sports Illustrated , Starline and Nike designs from the 1970s and ’80s. Some all-time classics are here, like Michael Jordan in rookie action, and the famous George Gervin “Iceman” theme poster. Then, we get into some fan-favorite New England-area stars like Craig James, Kevin Dineen and Carl Yastrzemski. Then, there’s some rarities we almost never see around, like an early-career Mats Sundin Quebec Nordiques poster, a posthumous Roberto Clemente “White-Border” Studio One poster from about 1977, and a late-1970s David Thompson Denver Nuggets poster sponsored by Pony. This is the room that will thrill the serious poster collectors! We hope these winners inspire you to make your sports rooms come alive with the endless possibilities that posters can provide! Browse for your unique selections any time at SportsPosterWarehouse.com. And for more pictures from this contest, including other views of these winning entries, view our contest photo gallery here. 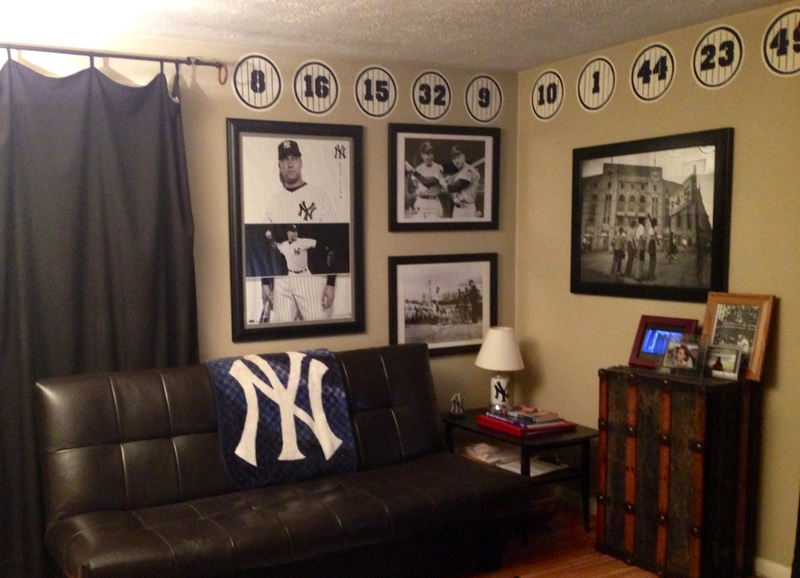 The Sports Poster Warehouse announces a “Share Your Fan Wall” photo contest, inviting sports fans to submit photos of their home sports shrines, poster walls and team memorabilia. Toronto, ON, March 12, 2013 – The Sports Poster Warehouse North America’s leading online retailer of sports posters and pennants, is inviting sports fans to show off their “fan walls”. Sports fans of all ages are invited to share photos of the rooms and walls where they display their prized sports posters, pennants, jerseys and other memorabilia from their favorite teams and athletes. The top photos will win spending sprees on SportsPosterWarehouse.com. It might be a Chicago Bears bedroom, a Maple Leafs Man Cave, a games room celebrating LeBron James, or even a neighborhood pub wall devoted to Celtics fever. Whatever sports decor theme these avid fans choose, they can finally gain some recognition for their team pride and win gift cards of up to $200 in sport posters. SportsPosterWarehouse.com is asking sports fans to come out of the “fan caves” and show off their flaunt their favorite sports posters and memorabilia. Contest entry is easy. Sports fans simply take a picture of their most prized fan wall — either at home, in their office, school classroom, even a bar or restaurant, and send it to SportsPosterWarehouse.com. Entrants can email their pics to info@sportsposterwarehouse.com, tweet their entry to @sportsposters with the contest hashtag #ShareYourFanWall or post it on the company’s Facebook page. 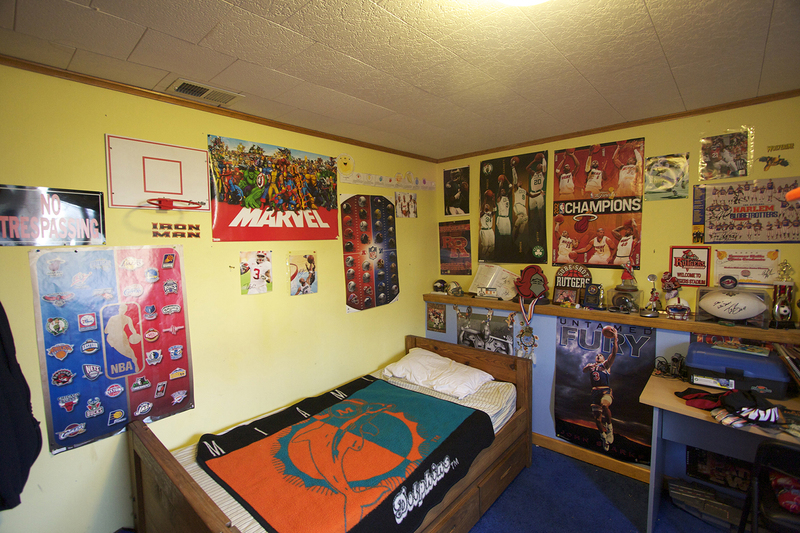 Parents are also welcome to submit pictures of kids and teens’ sports themed bedrooms, which are often covered with treasured sports posters and team swag. Any sport or athlete celebrated by fans is welcome, from NASCAR, to golf, to surfing, to rhythmic gymnastics. 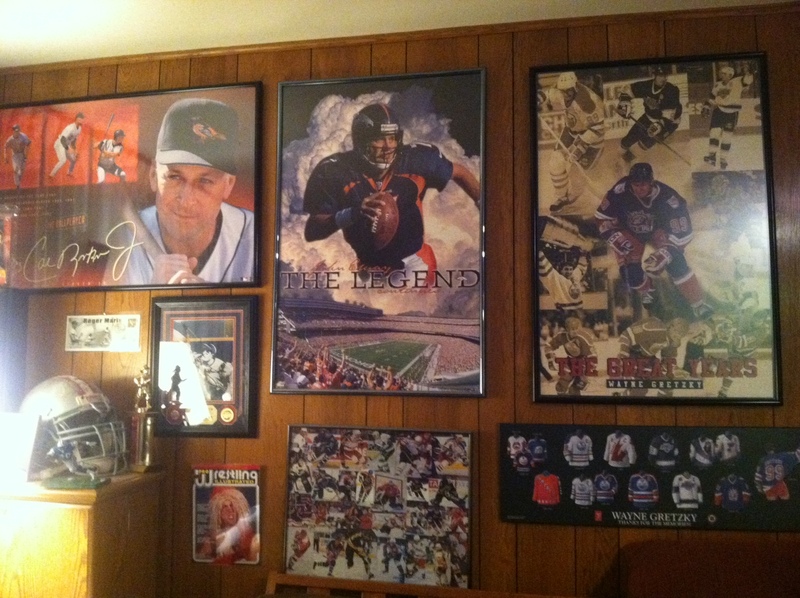 Sports fans are already entering the ”Share Your Fan Wall” contest. 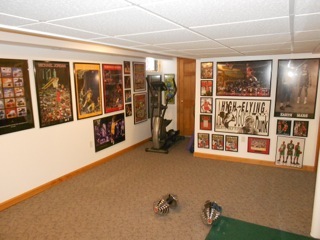 Craig Van Guilder of St. Paul, MN, was among the first, showcasing the wall in his “mancave” basement room. An avid poster collector since his childhood, Van Guilder said his biggest problem is finding the sheer wall space to keep up with his collection.”Need a bigger house!” Van Guilder said of his poster pride. “I’ve always been a huge fan of baseball, football and hockey. Can’t go wrong with posters of some of the greats!” Van Guider’s wall features American football legend John Elway, baseball all-stars Cal Ripken and Jackie Robinson and hockey superstar Wayne Gretzky, to name a few. The “Share Your Fan Wall” photo contest will be available for entry throughout the month of March, 2013 and a winner will be selected by April 2, 2013. Complete details are available on the Sports Poster Warehouse blog. The “Share Your Fan Wall” photo contest will be available for entry throughout the month of March, 2013 and a winner will be selected by April 2, 2013. Complete details are available on the SPW blog. The Sports Poster Warehouse is the world’s #1 source for new, rare and vintage sports posters, with a catalogue covering more than 10,000 different posters, pennants and team flags.Launched in 1998, Sports Poster Warehouse is a sports, fitness and motivational poster and pennant leader. Featuring current and vintage styles of posters and pennants, Sports Poster Warehouse carries physical inventory of the vast majority of its online offerings, ensuring customers receive products in a timely manner. With headquarters in Toronto, Ontario, Sports Poster Warehouse also has a local commercial showroom. To see best-selling posters and to order online for rapid delivery across the USA, Canada and around the world, visit sportsposterwarehouse.com. 10. Steve Nash, Canada’s future NBA Hall of Famer – His track record of MVP performances, deep playoff runs, and revolutionary point guard style, make him a must-have addition to the sports wall of any proud Canadian fan! 9. Canadian Skiing Vintage Poster Reprints – Canada has had some of the world’s best skiing destinations for nearly a century. Banff-Lake Louise, still a world-renowned resort, was made famous in the first half of the 20th century as the prime destination on the Canadian Pacific railway. Thanks to the Eurographics Corp. of Montreal, we now have six classic vintage reprints from this era in our Vintage Skiing Poster Reprints collection, along with other Canadian and non-Canadian vintage ski posters. 8. Canadian MLB Baseball Superstars – Take pride in Canada’s baseball heroes who managed to make it through all those long, harsh winters to persevere and make it to the big leagues! 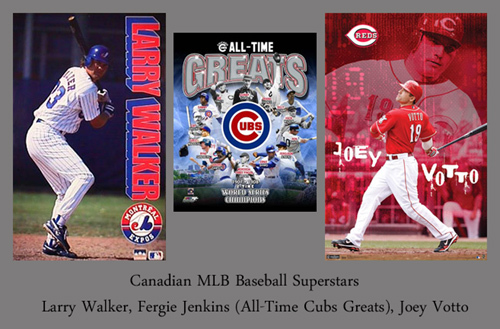 We’ve got the 5-tool superstar of the 1990s, Larry Walker; Canada’s first Hall-of-Famer, Ferguson Jenkins; Cincinnati’s super-slugger Joey Votto; and Toronto Blue Jays third base dynamo Brett Lawrie. 7. Canadian NHL Hockey Superstars – There’s just far too many players to mention here – but we’ve got ’em all! Whether it’s old-school heroes like Maurice Richard and Gordie Howe; 1970s sensations Bobby Orr, Bobby Clarke, Darryl Sittler or Guy Lafleur; 1980s legends Wayne Gretzky, Mark Messier, or Mike Bossy; 1990s dominators Patrick Roy, Steve Yzerman or Joe Sakic; or contemporary favourites Sidney Crosby, Steven Stamkos or Jonathan Toews; you’ll find endless ways to bring your wall alive with Canada’s greatest contributions to the sporting universe! 6. Official Olympic Games Posters – Imported from the IOC’s Olympic Museum in Lausanne, Switzerland, we are North America’s exclusive online distributor of official Olympic Games reprint posters. And we are proud to always have in stock, the official poster designs for Montreal 1976, Calgary 1988 and Vancouver 2010. 5. Ken Danby’s Iconic Hockey Art – Ontario artist Ken Danby went from unknown local painter, to one of Canada’s most beloved legends, when his “At the Crease” captured the imagination of Canadians everywhere in 1972. Is it a painting of Ken Dryden? Tony Esposito? According to the late Danby, it’s neither – it’s loosely based on his Guelph, Ontario Friday Night pickup league buddy. We are proud to be the last remaining retailer of Danby’s full-sized poster prints – At the Crease, as well as the two companion pieces, 1973’s “Lacing Up”, and 1997’s “Face Off”. 4. Team Canada Hockey, Salt Lake City 2002 Winter Olympic Champions – After the debacle of Nagano 1998, Canada came through at Salt Lake 2002 to regain our hockey pride, and return to our rightful place on the gold medal podium. Thanks to the heroics of Martin Brodeur, Rob Blake, Scott Niedermayer, Jarome Iginla, Paul Kariya, Mario Lemieux, Joe Sakic, Brendan Shanahan, Steve Yzerman and the rest of this group of contemporary superstars and all-time greats, Team Canada overcame the host Americans and reigned supreme once again! 3. Joe Carter “Touch ’em All” 1993 World Series Game 6 – In 1992, the Toronto Blue Jays made it onto everyone’s baseball map with their first World Series Championship. In 1993, Joe Carter did Canada one better, giving us an iconic moment that will live forever in the pantheon of baseball history! When he connected off Mitch Williams of the Philadelphia Phillies and gave baseball only its second World Series walk-off homer of all-time, Joe gave us a moment to be proud of forever, and an image we can all proudly hang on our Canadian sports wall-of-fame! 2. Sidney Crosby’s “Golden Goal”, Vancouver 2010 Winter Olympic Games – If you thought the pressure to win was heavy on Team Canada in 2002, try adding home-country expectations to the equation! In 2010, Canada’s Men’s Hockey Team was once again coming off a disastrous performance in the previous Olympic Games, and with the Gold Medal game against the Americans heading into overtime, it looked like the pressure may have been too much, after all. Then, Jarome Iginla and Sidney Crosby worked their magical give-and-go, and the rest is history – the golden moment, now available for your wall and your collection! 1. Paul Henderson “The Goal” , Summit Series 1972 Winner in Moscow – Need we say more? It was the defining sporting moment of several generations, and the drama of the image matches the drama of the series. It was a clash of styles, a clash of cultures, a clash of ideologies, and a story of perseverance and excellence that may never be matched in hockey history. When Paul Henderson beat Soviet goaltender Vladislav Tretiak with less than a minute to play, a nation roared, and Henderson became the poster-boy of all-time for Canada.